Home is supposed to be a place you belong. It's supposed to be parents who are there and siblings who bug you and a life that feels comfortable. It's not supposed to be an absentee mother or a drowned sister. But that's Vera's reality, and she can't stand it anymore. So she runs. She ends up in an old mining town in the middle of the California desert. It's hot, it's dusty, and it's as isolated as Vera feels. As she goes about setting up her life, she also unwittingly starts the process of healing and-eventually- figuring out what home might really mean for her. A novel written in prose can be a hard feat to pull off. I have to admit, I'm always wary about reading one -- it's so easy for the novel to be more about making a statement and less about actual substance. Also, I'm incredibly picky when it comes to poetry, I've been to one too many bad open night mikes! 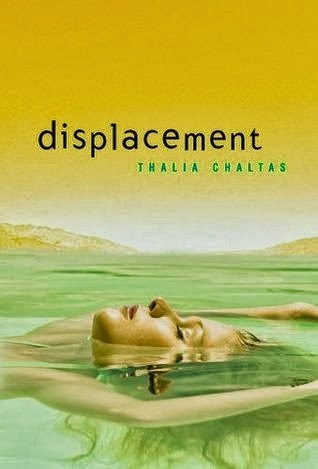 Displacement was a quick read, in part because of the prose style. But I also found myself drawn into the world of Vera, independent enough to uproot herself from her home, travel to a random town (well, more an outpost, really) full of other misfits and colorful characters, and immediately find a home and a part-time job. Vera is grieving for her sister, whom she starts 'seeing' . But Vera is also very much a teenage girl -- she complains about the only diner's bad food, crushes on her new boss, and angsts about her clothes. The other characters were a little less well-drawn. I liked her non-crush boss, a middle-aged man who threw pots for a living and was dealing with his own traumatic events. Her crush, a handsome Native American young man named Len, was much less likable. He breaks into her home not once, but twice, accuses her of stealing, and then has an encounter with the potter that showcases an ugly streak of homophobia. Vera never seems upset enough with him. She even goes back to work for him after the first time he breaks into her home (and steals all of her cash!). I just didn't understand that! Overall, I liked Displacement. Vera's voice is very strong, and the novel ends in a way that is hopeful without being saccharin. I also felt the prose writing lent itself very well in this circumstance.